Carnitine is a quaternary ammonium compound involved in metabolism in most mammals, plants and some bacteria. 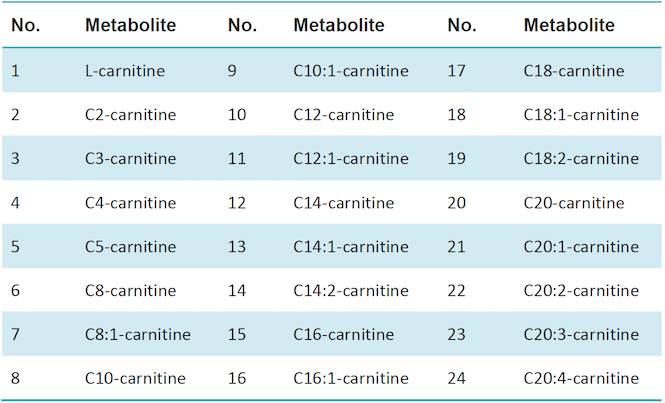 Carnitine exists in two isoforms, D-carnitine and L-carnitine. Only L-carnitine exists in animals, and is involved in oxidation of fatty acids, therefore, L-carnitine has been added in diet pills to reduce body fat. MtoZ Biolabs uses ACQUITY UPLC/TripleQuad5500 (Waters/AB Sciex) for analyzing carnitine and derivatives. Our service enables highly accurate qualification and quantification analysis of over 355 kinds of carnitines. With our optimized sample preparation methods, interference from high-abundance dominant metabolites can be greatly reduced, thus further increasing detecting sensitivity.